Essential plot rundown: After discovering matching images in ancient hieroglyphics, a team venture out into space in search of our creator. I had mixed feelings about this film. Some parts were really awesome, others not so much. It felt like there was too much going on, like a hodge-podge of ideas. Also, I think all the hype built my expectations to high, making it hard for the movie to meet them. I know trailers are designed to entice people to come see the movie. But sometimes they do their job a little too well, leading people to expect one kind of movie only to see another. 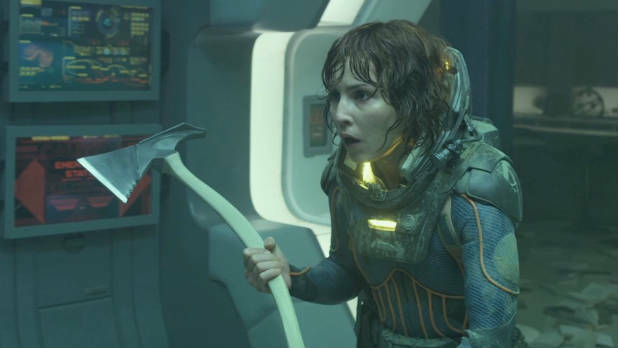 The trailers for Prometheus made it look like an intense, edge of your seat horror-thriller. But it wasn't. Yes, there were a few intense/action packed scenes, but that wasn't the tone of the whole movie as I was expecting. It's more philosophical based than action. Which brings me to the biggest flaw of the movie. The movie has it's central plot and them: Trying to find who created us. Which, in and of itself, is a great concept and would've worked fine by itself. However, the movie tries to to make connections to Alien and so it adds two things/events. And these two things are cool, but they don't work in the overall theme of Prometheus and feel out of place. If they were saved and used in a different sci-fi movie, they would have worked better. Prometheus is more about philosophy and beliefs, but these two things (I'm not even sure what to call them. Subplots maybe?) are more about monsters and horror. So, they didn't really work in the film. Yes, they do provide for some intense and scary scenes; but on the grand scheme of things, don't fit. Also, they don't make any sense at all. 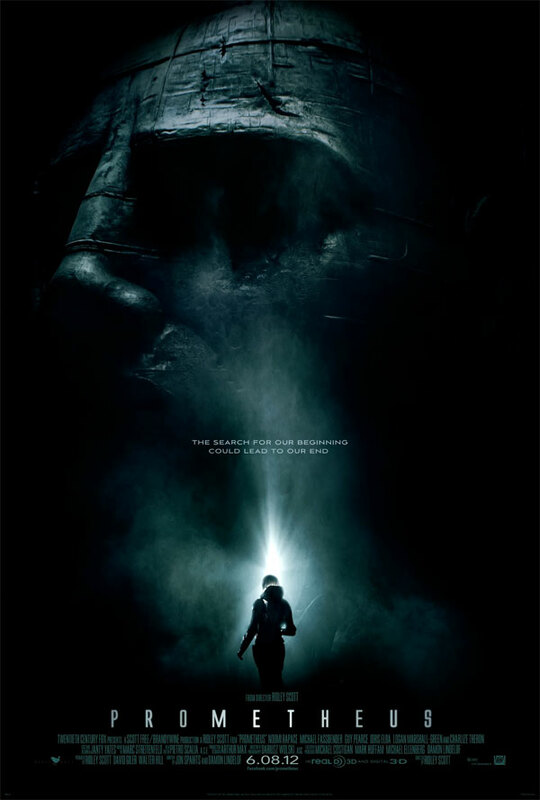 When Scott first starting making Prometheus, he said he was doing a prequel to Alien. Then he said he changed it to a generic sci-fi film. What it felt like was he was making a normal space movie, but then changed his mind again and wanted to tie it in to Alien. So, these two parts were included. I think it would have been a lot better and more thought provoking if these two parts were excluded and more time was invested into the creator-creation relationship. They did do this to some degree with Michael Fassbender's character, David. Just like in all the Alien movies, David is the token android. There are a couple of scenes where the topic of creator/creation is discussed in regards to David and the people who created him. It fit in nicely with the theme of the movie; I just wished they would have developed that more. Michael Fassbender gave a really believable performance as David. I'm no actor and I know nothing of acting, but I thought all of the main characters did a really good job. Noomi Rapace gave an outstanding performance as one of the scientists who heads the expedition. Tom Hardy was good as well, playing her college and love interest. Charlize Theron and Idris Elba also delivered. All of the other characters are just there and don't do much besides die or nothing. I knew the 3D was going to be awesome. 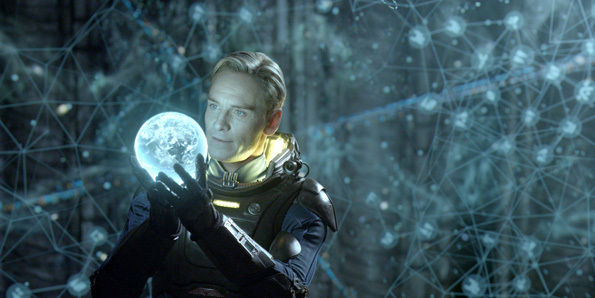 In this scene, David activates a hologram of the universe and it is spellbinding. It was beautiful to see in 3D. It's this type of film that proves 3D is worth it. The music I found distracting. Well, one song in particular. It has a lone horn, playing a melody. And every time I heard it, it drew me out of the film. I kept thinking Jurassic Park or something. It just didn't fit with the feel of the movie, drawing attention to itself. OK, for the next two paragraphs, I'm going to go into spoiler territory. So, continue on at your own risk. *Spoilers* There is one part that bugged the hell out of me. When they find out that Shaw is pregnant with an alien, they try to put her in one of those sleeper chambers so they can remove when they get back to earth. However, she hits them and runs away to the medical chamber. She then has it remove the alien baby. The whole time I'm expecting the people she ran away from to come after her. But, they never come. They'll like "Ah, she's too quick. Let's not chase her and stop her from possibly contaminating the whole ship. Do you want to get a coffee instead?" She even sees them literally five minutes later. And nothing is said of what just happened. Nobody asks what she did with the alien baby. You just can't ignore that! Acknowledge it or something! Shouldn't you make sure she's not going to spread a disease or something? And what about the alien baby? Shouldn't you go find it? Needless to say that it frustrated me a little. However, the scene where she removes the alien baby is probable the best part of the movie. That scene had the intensity that the trailer portrayed. This film is not a direct prequel to Alien; it's more of a prequel to a prequel. It sets the stage for what will happen, but there is still plenty that happens in between. It does explain who the Space Jockey is and where the xenomorphs came from. However, I found these explanations less than satisfactory. This may be one of the cases where things are better left unknown. Overall, it's a good film. The SFX, acting, and visuals are all well done. The story itself could use some work. It doesn't know what it whats to be; and thus, I can't decide how much I like it. I think it would have been a lot better if it scrapped every connection to Alien and been its own story, focusing on our quest to meet our creator. Then the story would have felt less jumbled and could have answered more questions. However, these questions may be answered sooner than we think. It's a good film, worth watching, though not as intense/scary as the trailer makes it out to be.